Fall season is finally here, bringing in crisp, cooler temperatures and brightly colored foliage in the surrounding trees. School is back in session, and the days are quickly getting shorter while the nights are becoming increasingly cold. You and your dog probably welcome the relief from the hot summer weather, but the fall season can also pose some extra challenges for your dog. From allergies caused by dry, windy conditions to new (and tempting!) foods and holiday decorations around the home, there are some special issues to consider during the fall. It’s a busy time of year for all of us and you want to make sure your dog’s health and safety is top priority during the fall season. So here are a few tips to taking care of your dog in the fall. In preparation for the cold weather, a lot of people change their car’s engine coolant during the fall season. Unfortunately, antifreeze contains a substance called ethylene glycol that has a sweet smell and taste that pets find attractive. Ingesting even a small amount of antifreeze is extremely toxic to dogs (and cats) and can often be fatal. Some of the early signs of poisoning from antifreeze include excessive thirst, lethargy and lack of coordination; internal damage can include severe kidney damage and/or kidney failure. Some people may switch over to a propylene glycol based product which claims to be less toxic than other coolants, though it is still harmful to your pet if ingested. If you decide to change your antifreeze at home, you’ll need to keep your pets away from your garage while you’re working on your vehicle and make sure you clean up any spills immediately. If your dog comes in contact with antifreeze, you’ll need to take him immediately to the nearest emergency pet hospital. When not in use, be sure you keep any remaining antifreeze out of reach from pets and children, and carefully depose of any used product immediately. Keeping your dog away from antifreeze is an important step in taking care of your dog in the fall. As the weather starts to change, rodents commonly seek indoor shelter for warmth and you might start noticing them inside your house, garage or barn. Some people use rodenticides to get rid of mice and rats, but rodenticides are highly toxic to pets and can be fatal if ingested. Secondary poisoning can occur if your dog eats a rat or mouse that has consumed rodent bait, since the anticoagulants found in rat poison stay in the rat’s system after they’ve eaten the poison. An important step in taking care of your dog in the fall is to use humane live mousetraps which you can find online or in most hardware stores. If you have to use rodenticides, make sure you place them in areas where your dog cannot reach them. If you think your dog has come in contact with rat poison or has eaten a rodent that has been poisoned by a rodenticide, you’ll need to contact your veterinarian immediately. Just like the spring, fall is a time where mushrooms can flourish due to the wet weather. Many types of mushrooms are generally safe to eat, but there are certain kinds of mushrooms that can be very dangerous to dogs (and people). Unfortunately, it’s not always easy to tell what types of mushrooms are safe to eat and which ones are toxic. So to be on the safe side, if you find mushrooms growing on your property, you should remove them immediately and properly dispose of them in a location where your dog cannot reach them. If you think your dog has eaten any type of poisonous mushroom, you’ll need to contact your veterinarian immediately – symptoms can include diarrhea, vomiting depression, tremors and seizures. Summer isn’t the only time of the year when ticks and fleas are lurking; tick and flea season often extends well through the fall season and sometimes even into early winter. There are a few ways you can help reduce the chances of your dog becoming exposed to ticks and fleas. Walk around your property and remove places where ticks like to hide out, such as in tall grass, leaf piles or garden litter. You should also frequently check your dog’s fur for ticks and you can also use a flea or tick comb to remove any ticks or fleas that you find on your dog. You can also use tick control or other repellent products, especially if you spend a lot of time outside with your dog hiking or camping. Fall is the time of year when snakes, skunks and other animals are getting ready to hibernate for the winter, and they are not going to be very cordial to curious dogs that come in and disrupt their business. The risk of snakebites typically increases during this time of year, so you’ll want to take care of your dog this fall by keeping a close eye on him and make sure he stays away from areas where snakes or other wild animals like to hide out. If you live in an area where snakes reside, makes sure you are well educated about the different types of snakes that are around you and know which ones are venomous. Now that school is back in session, you’re going to want to keep school items such as glue sticks, pencils, crayons and markers in a safe place where your dog can’t reach them. Whether they’re spread out on a dining room table or scattered across a bedroom floor, small school supplies can be attractive to curious dogs. Most school supplies are not highly toxic (unless large quantities are consumed), but they can cause gastrointestinal upset, blockage or pose a choking hazard if consumed by your dog. Keep a close inventory of what’s in your children’s school bags and make sure your dog stays away from areas where your kids are using their school supplies. Also, once your children are finished using their school supplies, make sure everything is cleaned up and is safely put away after each use. Mothballs, which are small white balls or pellets made of paradichlorobenzene, are often used indoors to repel and kill moths by slowly releasing a gas vapor. They are also often used outdoors to repel mice, snakes and squirrels. Mothballs, however, can be toxic and deadly if consumed by your dog – symptoms can include vomiting, diarrhea, tremors, possible kidney/liver failure or death. If you suspect that your dog has consumed mothballs, you’ll need to contact your veterinarian immediately. As with all dangerous substances, it’s best to keep products that are toxic away from your home and instead, find safer non-toxic alternatives. Holiday season typically means lots of yummy foods and beautiful decorations that are all so tempting for your dog! From the shiny decorations to the delicious roast turkey and flavorful desserts, you definitely want to do everything you can to keep your dog safe during the holidays. While you are celebrating with friends and family, you’ll need to keep food out of reach from your dog, especially food that is on the kitchen counter top or on the dining table. Many human foods can be extremely dangerous for dogs to eat such as chocolates, nuts and turkey bones. Plus, rich fatty foods can also cause stomach problems such as diarrhea or gastroenteritis or even more serious problems. Also, many of us love to decorate our homes for the holidays, especially with holiday plants, garlands, Christmas trees and wonderfully scented potpourri. But all of these festive decorations can be problematic for your dog. Shiny decorations can look like play toys for your dog, and many of them can quickly and easily become choking hazards. Tinsel can cause intestinal obstruction if consumed, and poinsettia plants and potpourri are toxic if eaten by your dog. So have fun this holiday season, but keep your dog’s safety as a top priority as you are decorating and celebrating the holidays. Just like people, seasonal allergies can be a problem for many dogs. Common skin problems in dogs are often caused by dry, windy conditions that come along with the fall season. If you see your dog chewing, licking and scratching himself, you’ll want to speak to your vet immediately so that it does not become a bigger problem. Some dogs may experience respiratory allergies triggered by pollen, grass or mold spores that are typically present during the cool, fall season. Symptoms could include stuffy nose, sneezing, coughing, nasal discharge and red, watery eyes. If your dog is showing any signs of allergies in the fall season, contact your veterinarian so he can diagnose and prescribe medications to help your dog. If your dog is prone to seasonal allergies, you might want to keep him inside the house with the windows closed during the late morning hours when pollen is at its highest count. You can also use an air purifier inside your home to help remove dust particles or other potential allergens. If you keep your dog’s coat clipped short during the summer, fall is definitely the time of year when you should let your dog’s coat grow back. He’s going to need that extra fur to keep warm during the winter, just like you’ll need an extra coat, too! Also, if your dog is a breed that has thick, long hair, you’re going to need to brush his coat out regularly so that it doesn’t get tangled and matted – this will also help stimulate his skin and undercoat. Your dog’s skin and coat could also become dry during the colder months, so try giving your dog MaxiDerm which is rich in essential fatty acids. As the weather starts to change, you may need to adjust the amount of food that you give to your dog especially if you spend a lot of time outdoors in the cold weather hiking and playing with your dog. Your dog uses food as fuel to generate body heat, so if you and your dog spend a lot of time together outdoors in the cold, he’ll probably need to eat more than he normally does during the warmer summer months. Fall weather also means that the days are shorter and there are going to be days where it will be dark outside when you take your dog for his walks. You can keep your dog safe by using a light up collar and reflective gear so that he will be easy to see while you are out walking. If you live in an area were chemicals are used on the ground to melt ice and snow (such as ammonium nitrate, propylene glycol, and sodium ferrocyanide), keep your dog away from these areas as you do not want it to get on your dog’s paws. Once you’re done with your walk and you get back home, you’ll need to thoroughly clean and dry your dog’s feet in case he picked up any ice or snow during your walk. It may be a little more challenging to take your dog for walks when it’s dark outside or when the cold wind is blowing, but your dog will still need a regular exercise schedule even during the cooler months. 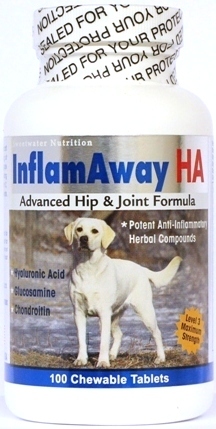 Also, if you have an older dog he may be more prone to joint stiffness during the colder months, so you’ll want to keep him on InflamAway HA which is an effective joint supplement with Hyaluronic Acid for dogs. These few tips should help keep your dog healthy and happy during the fall season. Do you have any creative or fun tips to share?